Now most of you have been along for the ride through my downs, and even lower than low dating experiences, notice I didn't say "ups and downs".. and the final straw for me has been getting stood up for the gazillionth time, but that's neither here nor there, I chalk it up to mofos being trife and keep it moving.. But let's go back a little further in my dating life and look at the downfall of it all..
King Mofo and I fall in love, King Mofo and I shack up and play house in a new city like we're crazy, King Mofo eventually cheats, I throw his arse out, King Mofo comes crawling back, I forgive him and give him another chance. 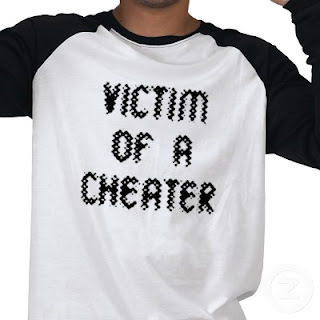 This week on The Social Hour we are discussing whether or not cheaters should get a second chance? King Mofo and I move back closer to his fam, King Mofo and I are back in love and all is right with the world allegedly, King Mofo starts acting crazy again, and lo and behold.. his arse is cheating again.. with not one, but at least 2 chicks (that I know of)..
Well besides the long drawn out saga I simplified for you, and the complete utter disrespect and having my heart ripped out of my chest and tossed back at me..oooh I don't know.. perhaps it's the fact that most cheaters realize they got away with the ish once, so they can do it again and again. I have no tolerance for that ish. Now I know you're asking well why did you give him a second chance??!! Simple. I loved him and didn't want to be alone, and besides, I actually felt in my heart of hearts he would change. Now.. why didn't I give him one more chance after that? *blank stare* you can't possibly be serious asking me that?! I do know this, I don't want to ever be the person that I was back then, accepting that the mofo totally disregarded our commitment, disrespected me, lied to me, and made me feel like everything was my fault.. NO THANK YOU.. besides, if they feel the need to cheat, they can kick rocks and keep on keepin on with the heaux they started creeping with. She (or He.. however you get down) can have his trife arse.. It's not worth being in a relationship where the trust is gone, and the constant nagging in the back of your mind wondering if that person is up to no good when they aren't around you, questioning every little thing they say, etc.. that alone is enough to drive someone insane. Ultimately, it comes down to one thing.. do you respect yourself enough to realize that if he/she didn't love you enough to stay faithful, do you think they will change when you give them a second chance? Granted I am sure there are some cheating arse mofos that allegedly change, I just don't plan on sticking around after they cheat to find out..well unless he's pullin in the Kobe Bryant money LMAO.. jk. kinda. The road to recovering from a cheater is a long one, trust me..it takes a long time to find yourself and love yourself again, but I do know this..I love me more than some mofo that can easily stick his peen in someone else's cookie box without a second thought about me and my feelings. So Mofo Chronicle Readers.... do you think cheaters should get a second chance? Tune into The Social Hour every Tuesday on Urban Soul Radio.. just log onto www.thesocialhr.com 7p to 9p PST or 10p-Midnight EST and call in! Once the trust is gone, the relationship is over. So I think you were good for letting him come back a second time. I used to regret that decision, but then I realized, it made me who I am today..thanks for reading! Meik, this a tough one. Any woman's mind clearly says no to a second chance. But often our hearts are willing to believe that he can change. The reality is that he CAN but whether or not he really will is up in the air. So you give him a second chance, he cheats again and you are ready to never ever give anyone a second chance again. Which is probably a good idea. But who is to say every second chance will work out like that? I don't know, it's tough. I think until you are in the situation and consider all the factors it's hard to know exactly what you'd do although I can probably say I wouldn't give a guy a second chance after cheating. Sis I would love to say I could forgive and forget but I just can't. If I took a cheater back I'd be the one to bring that up later. For instance if he's late to pick me up I'd have to throw in "I bet you weren't late for her...". You get what I'm saying. So in the end it would be bad for both of us. Once you cheat the trust is gone and we're done. This is so on point that I only have two words. I agree!!! Great post. I'm now a follower.